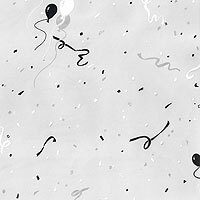 Black and White Balloons and Confetti Cellophane Roll 24 inches wide x 50 ft long. This is a great design for classy birthday parties and over the hill themes. Cello background is clear.